Howdy, loyal readers of PH8. If you haven't been around for a while, please take note that we've moved to a new home. We'd love for you to come visit us at Cards Conclave and check out the other great writers while you're there. Thanks for reading! Following the weekend that shall no longer be named, suffering a sweep at the hands of the Reds in Cincinnati that was really making me rethink this post – or, more specifically, my assertion that the 2011 Cardinals were much different than the 2010 version. No sooner had the Cards finished rolling over for the Redlegs than they were back at home to face one Clifton Phifer Lee. That 93 pitches number is highlighted because it’s where I think the Cardinals were able to succeed, obviously with a little help from an abnormally wild (or abnormally squeezed) Lee. Quite the difference. 2.91 pitches per plate appearance in 2009, 4.21 pitchers per plate appearance last night. Sure, we’re talking about two completely different Cardinal lineups, but it’s a trend I have noticed improving for the Cardinals as a team. 3.88 pitches per plate appearance in 2011 ranks them near the top of the National League. Compared to 3.76 P/PA in 2010 and a NL second-worst 3.66 P/PA in 2009, NL second-worst 3.67 P/PA in 2008… you get the picture. The Cards are seeing more pitches, either as a function of facing wilder pitchers or increased plate patience. While Lee’s uncharacteristic lack of command last night helped, the Cards were patient at the plate, as they have been all season. In my opinion this has been a huge factor in the Cardinals’ offensive surge in 2011. The Cards’ defense looked pretty dang good! Nick Punto turned a nifty double play with Ryan Theriot in the top of the eighth inning to get the speedy Jimmy Rollins. It was, dare I say, fancy. Albert Pujols held his own at third base, starting a double play himself and making a sliding play of sorts on another ground ball. You can watch all (I believe it’s all of the plays that came his way) of the balls he fielded here. 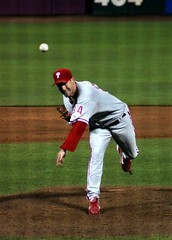 Cliff Lee‘s change-up made Allen Craig look silly a couple of times. ‘Course, Cliff Lee has a tendency to make a lot of hitters look silly a couple of times. Jake Westbrook was phenomenal, getting through seven innings for the first time this season. His performance was a bit lost in all of the hoopla about Pujols playing third and Lee issuing all those walks, but kudos Jake – the Cards needed that. The bullpen! Eduardo Sanchez surrendered a hit in an otherwise uneventful eighth inning, while Fernando Salas came on to get the save in the ninth. It was about as blemish-free as a Cardinals fan can expect bullpen outings to be thus far, and a welcome sight. Salas looks to be the odds-on favorite to continue to get the ninth inning duties. Lance Berkman is making a lot of fans with his early-season exploits, the home runs, the long run at or near .400 batting average – but I’m really seeing something from Puma now that his bat has quieted down a bit. We knew that he wasn’t going to hit .400 this year, but what’s more important is that even though the bat is a bit quieter, he’s still drawing walks – just as he always has. He drew another two from Lee last night, and his on-base percentage currently sits at .443. That’ll do Lance, that’ll do. Great to see the skipper Tony La Russa back in the saddle last night. Here’s hoping he’s on the downside of his ailment. I can’t help but like Nick Punto, in all his scrap-tastic, gritty goodness. Sue me. Writing about the Cardinals and other loosely associated topics since 2008, I've grown tired of the April run-out only to disappoint Cardinal fans everywhere by mid-May. I do not believe in surrendering free outs. Yeah, Otter – I wouldn’t wish that on anyone.